Kühe Im Nebel - "Flesh and Steel Society" / Tom "The Perc" Redecker - "Electric Kindergarten: Rarities Vol. 1"
Originally released back in 1987, Flesh and Steel Society was a project of Tom "The Perc" Redecker, perhaps best known to AI readers as a member of The Electric Family. This, however, does not sound anything like The Electric Family. Flesh and Steel Society finds The Perc exploring dense sound collages of sound effects, squelchy, burbling, spacey electronics and weird vocals mixed with songs built around gothic organ and mechanical, metallic beats. Redecker and his co-conspirators vocalist OWI and lightshow expert Klaus Penris have clearly been influenced by some of the early 70's Krautrock bands, especially Faust, but are striving to update the sound for a mid-80's audience, throwing in a bit of Chrome influence with liberal injections of that early indi/college radio sound as well (the metallic beats can at times sound a little cheesy, but I think that's how they wanted them to sound!). Flesh and Steel Society is truly a strange trip. The cover art, depicting the robot soon to be made of flesh from Metropolis somehow just fits the Teutonic industrial/organic grind of the album perfectly. Electric Kindergarten: Rarities Vol. 1 is a collection of tracks from various projects involving The Perc dating from as early as 1974 and as late as 1997, though most are from the 80's. 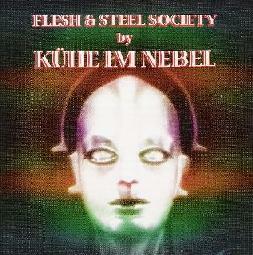 It includes, amongst other songs, two tracks by Kühe Im Nebel not on the Flesh and Steel Society album (though oddly, one of them is called Flesh and Blood Society). These two tracks are more in the song-oriented variety, as opposed to sound collage, though there is a touch of the latter in them as well. The rest of the tracks are a totally mixed bag, from the spacey electro-pop of The Perc's Inhaler to the acoustic groove of Pissrinne's Lovin' Baby Boy, a cover of the old Melanie tune, with some lovely guitar playing and Redecker's deep vocals. One of my favorite tracks is another one of the Pissrinne cuts, Everybody's like the other, a minimalist, dissonant John Cale/Velvet Underground style blues tune with lo-fi guitar and crazy flute. 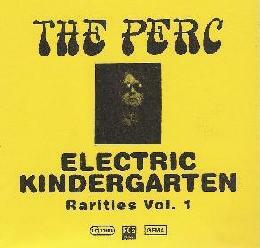 While all of it makes for interesting listening, Electric Kindergarten may be something for Perc completists only. But the more cohesive nature of the Kühe Im Nebel album makes it a must have for fans of 80's experimental music. For more information you can visit the Shack Media web site at: http://shackmedia.de.